This mod may have been done before somewhere on the internet, but it hasn't been done by me. I did all the work on this myself, and if you haven't seen it, then it's new to you! This mod makes the bubble blower a bit more realistic, sims will no longer fly in the air while using the bubble blower. I admit I did use the bubble blower long ago when I first purchased University, but ditched it as soon as I saw them flying. 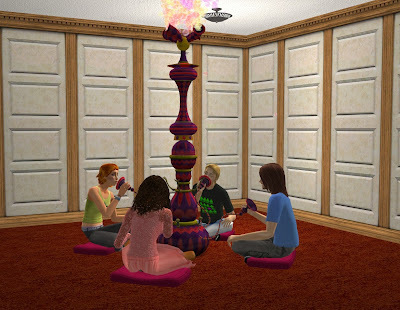 Flash forward several years later, and one of my boyfriend's friends starts hanging out over here, so I introduce him to The Sims 2, and tell him about the bubble blower, and he really likes it, so I figure I'd try out a mod for it (even though he likes the flying). The wall can be downloaded here, the blonde man's outfit can be download here, the brown haired man's top can be downloaded here, and his hair can be downloaded here, the African American woman's top can be downloaded here, her skirt can be downloaded here, and her hair can be downloaded here. The red headed woman's outfit can be downloaded here, and her hair can be downloaded here. Enjoy! I can't seem to locate the Download link for this one.? Sorry, I forgot the download link and didn't have good access to my computer. Link is now fixed up.